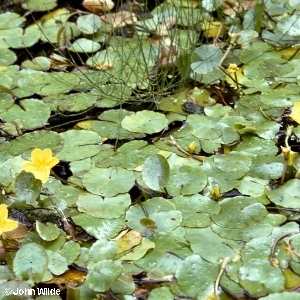 An introduced aquatic perennial that is locally established in canals, ponds and lakes. Introduced deliberately into the River Lagan near Belfast some time before 1836, but it became extinct in that river about 1960. From the mid 1980's it began to be recorded again at new sites as the plant apparently gained renewed favour as an ornamental pond plant. It is mainly found in the area around Belfast, but there are also reports from the west of Northern Ireland. Probably most records refer to sites where the species has been deliberately introduced.